As Megan and Kristina can attest, my kitchen was little more than a hole in the wall in December. 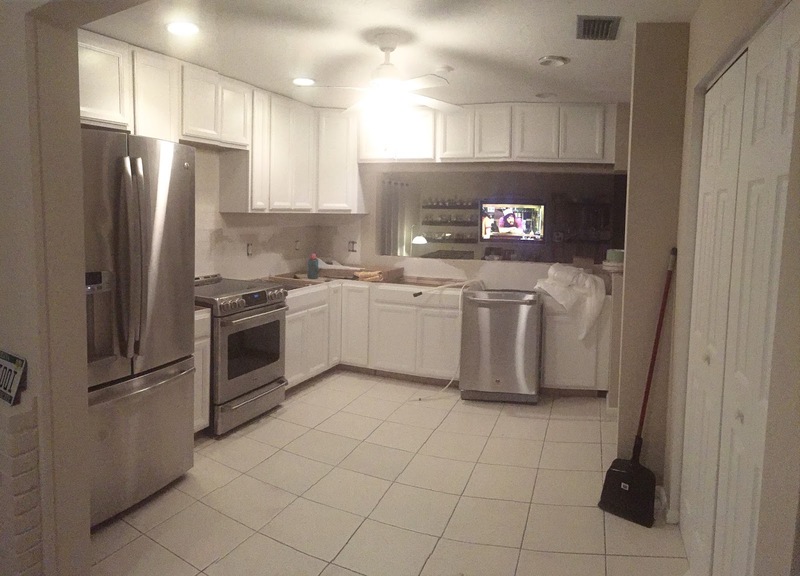 This month, we've made huge progress, and within the next few weeks, the kitchen will be fully functional! Obviously this is the "we just moved in" photo. Notice the closed wall, ugly color, and wasted space near the ceiling. Finally, the cabinets have been installed! I came home from work to this lovely surprise! The bottom cabinets went in the next week. 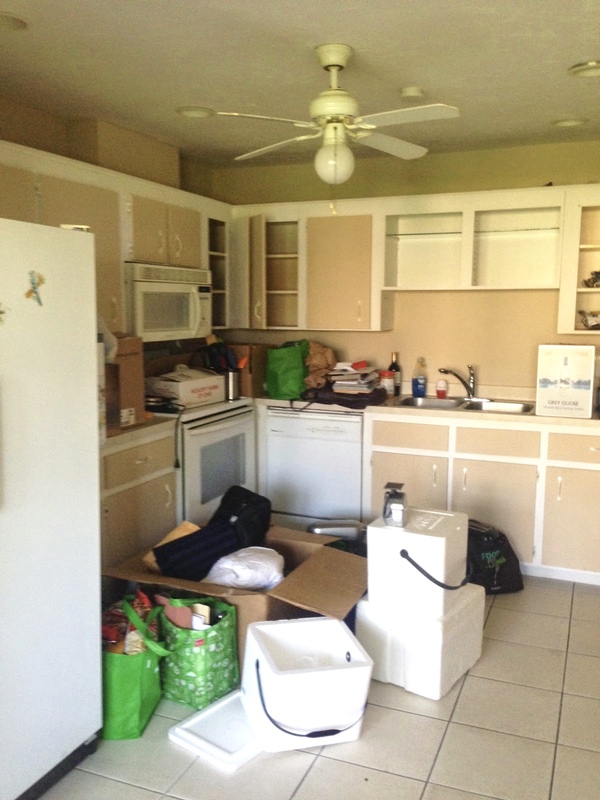 We moved the sink, dishwasher, and stove to maximize counter-space and make the kitchen more intuitive. I love that we have drawers with special slide-outs for silverware. 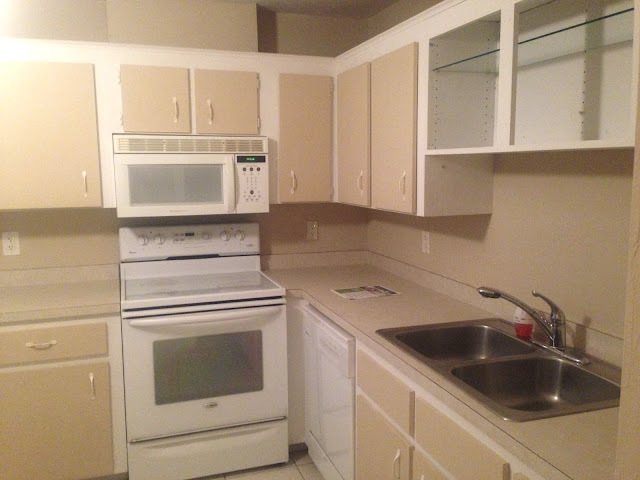 The big bottom cabinets also have pull-out shelves for easy access! Then, we got "new" (gently-used) stainless steel appliances from Kristin and Stephen. Our friends James and Rhonda helped Matt move them in and helped remove the old stuff...which Matt put on our lawn as freebies and which were gone within hours! We still need to install the microwave/Advantium oven. It's all coming together! I'm in love with the appliances. They make the entire kitchen seem like...an actual kitchen. Matt even commented that the fridge - sans pictures and postcards - looks pretty sophisticated. I think we're both just glad to have things shaping up and looking good! Our granite countertop was measured this week, so it will be installed in the next 10 days or so; I've been looking at backsplashes because we'll be installing that as soon as the countertop is done. And once the counters are in, we can get the water all hooked up and I'll be able to really cook again! We need to choose hardware for the cabinets and finish some detail work along the ceiling and floor. We'll probably change out the lights and the fan...but all that is cosmetic! ...and this is one of the backsplashes I'm thinking of. I like the look of frosted glass. We may go with something with a blue undertone. The bottom line is that our kitchen will be fully functional in the next couple weeks! It's been out of commission since September! It's been a long, long overhaul, but it's going to be so worth it. Most importantly, it will be done in time for Passover, so I'll be able to host as usual. Even though Passover is in late April, I've already sent out invitations because I'm so excited! Have you ever done a big home-improvement project? I love what you have there! It looks so clean and elegant. We'll definitely be going for a SMOOTH backsplash. We've definitely been hearing how hard textured ones are to clean. Awesome! I think the silver metallic ones are going to look really good with the granite. Thanks, James! And thanks so much for your help!! That backdrop is really pretty! The appliances look AWESOME! And I know that granite and backsplash are going to look great. I didn't realize you knocked out a wall because I am stupid and don't know anything about homes. It's a huge improvement. Your house is cute to begin with. Ha, yeah! The demo on the wall was the main reason the kitchen took so long to do, because we had to re-drywall it and get new paint to match. But it does look like it belongs, so that's good! Wow! That looks so beautiful! I love the appliances and the backsplash! I've only ever rented, so I've never done any home improvements, but that looks pretty tough! I can't imagine not having a kitchen since September. Living without a kitchen as been pure hell. I'm so glad I can see the light at the end of the tunnel! Wow, what a transformation!! It looks great, I'm sure the granite will be an awesome addition as well. Congrats! I've also only ever rented, so no home improvements here. We want to have our own house one day, but I know it will be a challenge for me to have the patience to live through remodeling of crucial rooms. After this whole ordeal, we've changed our minds about redoing any other rooms. 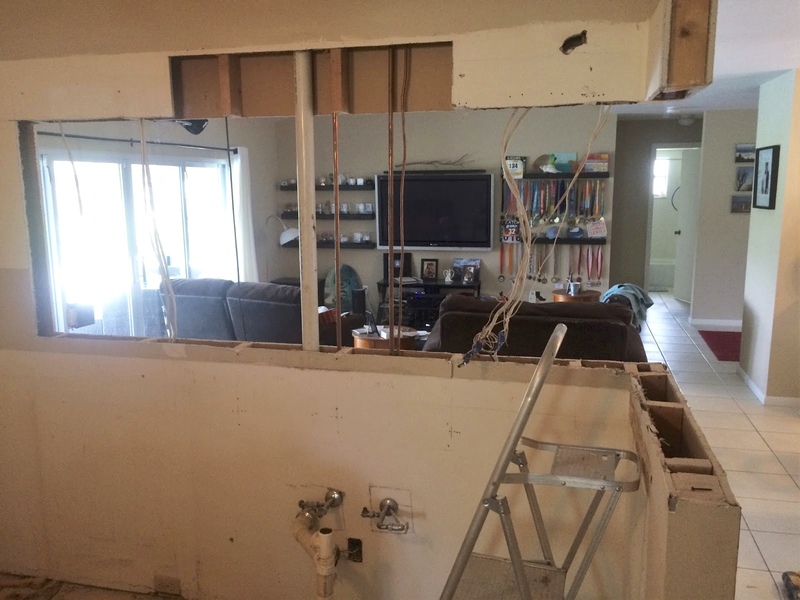 We wanted a "minimal fixer upper" so luckily we don't have to do much more. OH, it is sooo pretty! We renovated our bathroom a few years ago and since it is the only bathroom in the house we had to move out for a week, which turned into two weeks. But in the end the bathroom was beautiful. Your appliances are gorgeous! I want friends like yours!! We originally wanted to redo the master bath after the kitchen, but now we have cold feet. I can't imagine having to use the guest bathroom for weeks! it looks like its coming along great! 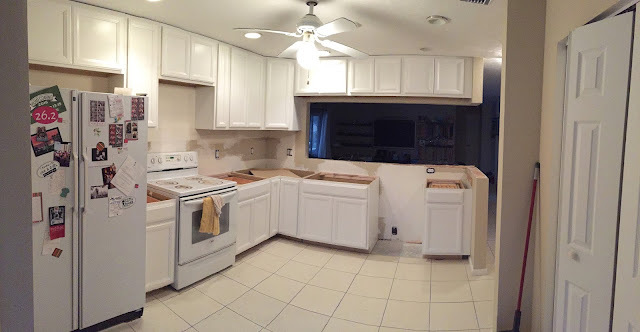 I'm about ready for some small scale remodeling in my kitchen ( mostly new cabinet handles and painting... although it would greatly benefit from a total overhaul!) congrats! What a fantastic makeover! Gah, I wish my boyfriend were remotely interested in doing renovations...when we move into our first home, I'm banking on a house with a modern kitchen! It must be really satisfying to see the hard work pay off.